Perhaps one of the most surprising if not actually unsettling things about the Internet and the Web is that there is always something new on the horizon and that it is very difficult to see where this new technology will take us. When ICT was just about big computers and organisational systems it was pretty obvious where the technology was moving us. 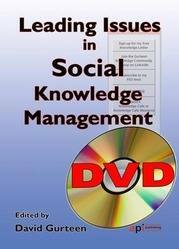 This DVD consists of a conversation in which David Gurteen discusses a wide range of issues in and surrounding developments in Social Knowledge Management. The discussion is prompted by Prof Dan Remenyi.